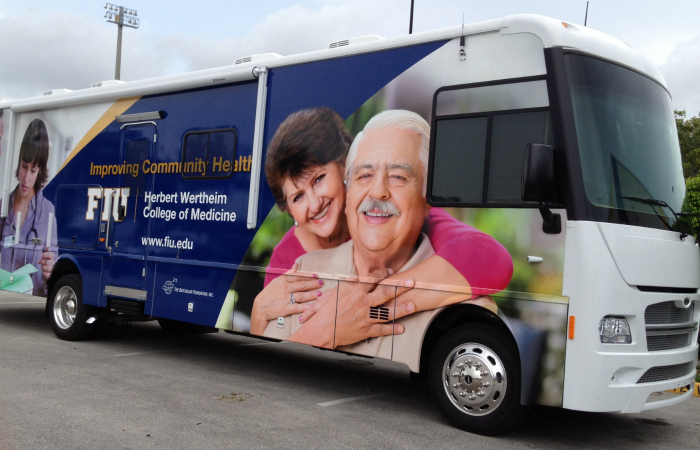 Health Foundation of South Florida increased its support to the Herbert Wertheim College of Medicine’s cornerstone educational program, Green Family Foundation NeighborhoodHELP™ (GFF NeighborhoodHELP™), by awarding a second grant for the program’s Mobile Health Center. The mobile clinic provides free, accessible primary care to household members in their own neighborhoods. The $45,000 grant from Health Foundation will fund laboratory, medical, educational and program supplies to help deliver comprehensive health care services, including labs, immunizations, disease management and specialty referrals, to uninsured and underserved patients enrolled in the GFF NeighborhoodHELP™. The program launched the Mobile Health Center in 2012 supported by a $65,000 Health Foundation grant. GFF NeighborhoodHELP™ is a community-based, interdisciplinary health professions training program that provides health and social services for needy communities in north Miami-Dade County. FIU medical, social work, law, and nursing students work together in teams to learn from, collaborate with and care for medically underserved households.